The powerful 6.3-magnitude quake struck around six miles outside Christchurch during lunchtime rush hour, causing widespread destruction and injury. Eyewitnesses said the three-mile deep tremor, believed to be an aftershock from a 7.1 magnitude earthquake which struck last September, levelled high-rise buildings, tore up pavements and sprayed rubble onto the streets below. A state of emergency has been declared in the city with collapsed debris and buildings trapping an unknown number of people. 2-22-2011 6.3 Christ Church Earthquake – New Zealand’s Prime Minister has confirmed 65 people have died, following a powerful earthquake in the city of Christchurch. That number’s expected to rise significantly. The magnitude 6-point-3 quake struck just after midday, causing busy office buildings to crash down in the bustling city center. Cries for help could be heard from beneath the rubble, during a desperate scramble for survivors. Rescue crews from across New Zealand and Australia are at the disaster site, where a state of emergency has been declared. New Zealand’s Prime Minister has confirmed 65 people have died, following a powerful earthquake in the city of Christchurch. That number’s expected to rise significantly. The magnitude 6-point-3 quake struck just after midday, causing busy office buildings to crash down in the bustling city center. Cries for help could be heard from beneath the rubble, during a desperate scramble for survivors. Rescue crews from across New Zealand and Australia are at the disaster site, where a state of emergency has been declared. The building’s plan is a modified Greek Cross with four arms extending outwards from the central tower, which stands 211 ft tall. Situated in Copley Square, which was originally a mud flat, Trinity rests on some 4500 wooden piles, each driven through 30 feet of gravel fill, silt, and clay, and constantly wetted by a pump so they do not rot if exposed to air. Its interior murals, which cover over 21,500 square feet were completed entirely by American artists. Richardson and Brooks decided that a richly colored interior was essential and turned to an at the time unknown John La Farge. The Church’s windows were originally clear glass at consecration but later adorned. Four windows were designed by Edward Burne-Jones and executed by William Morris. Another four windows were done by La Farge, who used a revolutionary style of layering opalescent glass. 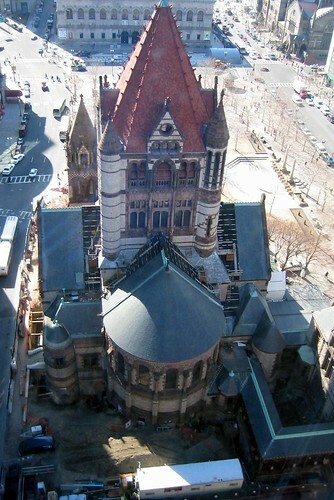 In 2007, Trinity Church was ranked #25 on the AIA 150 America’s Favorite Architecture list. 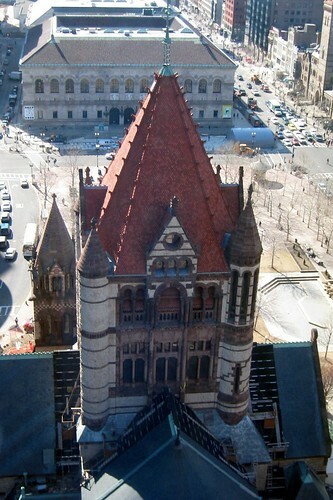 The Boston Public Library was ranked #90.